I have to admit the season for stuffing my face is here. The food around the holidays and the comfort food on cold nights can be super yummy but most likely not that healthy. This recipe is one of my favorites and I don’t feel guilty when I lick the bowl clean. The few simple main ingredients are very healthy for you. For me, it is hard to come across a healthy meal that can hit the spot. 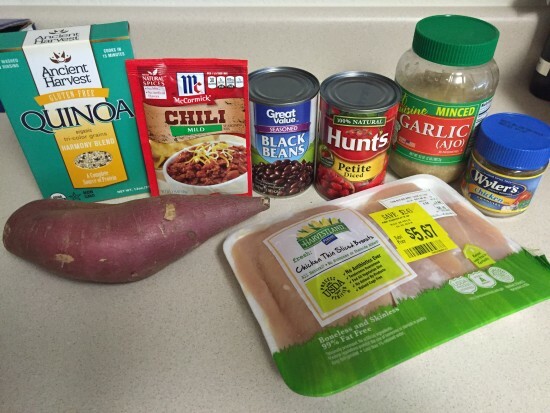 While this is not a zero calorie meal, almost all the ingredients have health benefits. So it’s a win/win! Chicken is a lean and good source of protein. It also contains all the amino acids essential for human health. It also contains vitamin B-6 and B-3 which helps with metabolism and can also aid in weight loss. Sweet potatoes are an awesome source of beta-carotene which is a precursor to vitamin A. Carotenoids help with eyesight and boost our immunity. They also contain vitamin B-6, C, and D. Iron, potassium and magnesium are other good-for-you minerals that are found in sweet potatoes. Quinoa non-GMO, Gluten Free and usually grown organically. While it technically isn’t a grain, it still counts as a “whole grain” food. Quinoa is also is high in fibers, protein, vitamins and minerals. 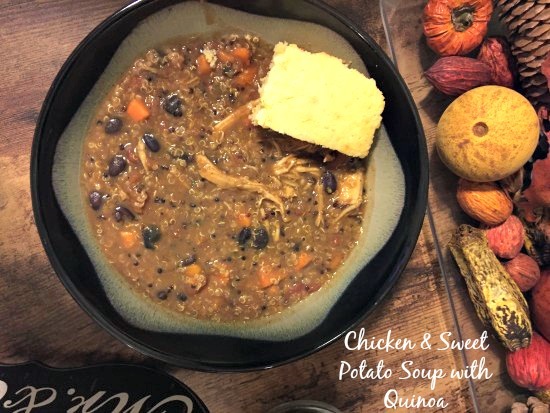 This meal is perfect for those fall nights at home or a great dish to take to a potluck! 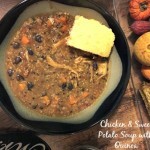 This is a healthy crockpot soup with a great taste.It is easy to prepare and easy to eat with out filling guilty. You can use store bought chicken broth or I like to use the chicken granules. 1 teaspoon to each cup of hot water.